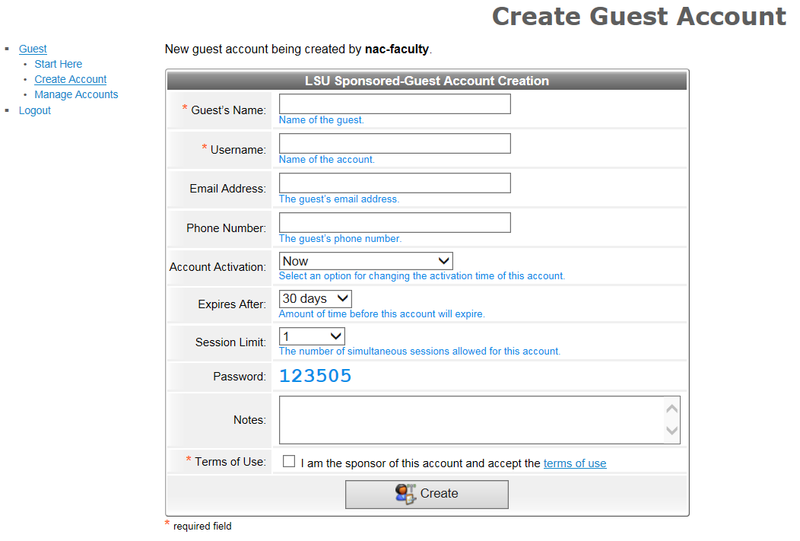 There are varying reasons for creating a LSU NetGuest Account. 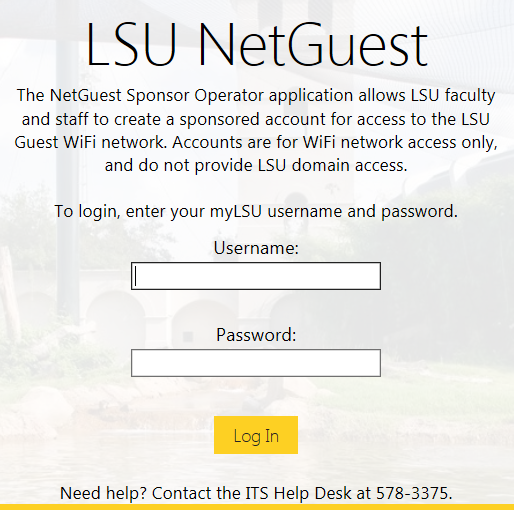 Any member of the LSU Faculty or Staff may request a NetGuest Account in order for a campus visitor to be able to access the LSU guest wireless network from their own equipment. One wireless username and password can be used for multiple individuals within a single group. If the creator of the NetGuest account forgets or loses the password, he or she must recreate a new NetGuest account. see GROK Article 14785 on how to securely access the LSU Network from anywhere with an Internet connection. (You will need to set up a VPN). 2. Fill out the Account Creation Form and Click Create. 3. Specify a username. A random password will be generated. The account will be purged at the end of the expiration time (as indicated on the form). 1. Create a new NetGuest Account Each Month. 1. Request a NetGuest Account. 2. Email the Help Desk at helpdesk@lsu.edu. Include a message requesting an extension for a Specified Guest Account and the Requested Time to extend the account. 3. The Help Desk will route the request to the IT Security and Policy group who will research the request and either Reject or Approve the request. 4. If Approved, the NOC will extend the account and you will receive notification of the extension. Request a Sponsored Guest Account. Under very limited and controlled circumstances, and with the approval of IT Security and Policy, a special permanent NetGuest Account may be created which can be used on the lsuguest wireless network. 2. Email the Help Desk at helpdesk@lsu.edu. Include a message requesting a permanent NetGuest Account. 4. If Approved, the Account will be extended and you will receive notification of the extension. Special circumstances such as a conference may also permit one or more accounts for use by conference guests. 1. Email the Help Desk at helpdesk@lsu.edu. Include a message requesting Guest Accounts for Conference Guests. 2. The Help Desk will route the request to the IT Security and Policy group. 3. These will be Secondary Accounts assigned to the LSU employee.